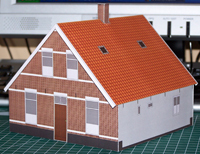 1/72 scale paper model of a small Dutch farm house. Farmhouses like this turn of the century one could naturally be found by themselves near their fields, but also in villages. The decoration over the front door is a cast iron version of the Tree of Life, still common in older buildings.